KKPKP’s struggle towards getting the Pimpri Chinchwad Municipal Corporation (PCMC) to honour its responsibilities towards waste pickers after the termination of the MoU in October 2012, continues in the courts. The PCMC has resorted to repeated postponements of court hearing dates using various excuses to procure extensions, issued indirect threats and tried to intimidate waste pickers. The new municipal commissioner, while not unsympathetic to the waste pickers’ cause, is not familiar with the court case and has asked for time to get to know the issues. While the Assistant Commissioner had agreed to the issue of new, updated I-Cards, the police are insisting that without police verification, no I-Cards should be issued. Apart from the difficulty of the verification process and the long delays it will involve, this is a contentious issue since it amounts to re-criminalisation of the waste pickers – who have fought hard to establish their credentials in society and to remove old, traditional biases against them. 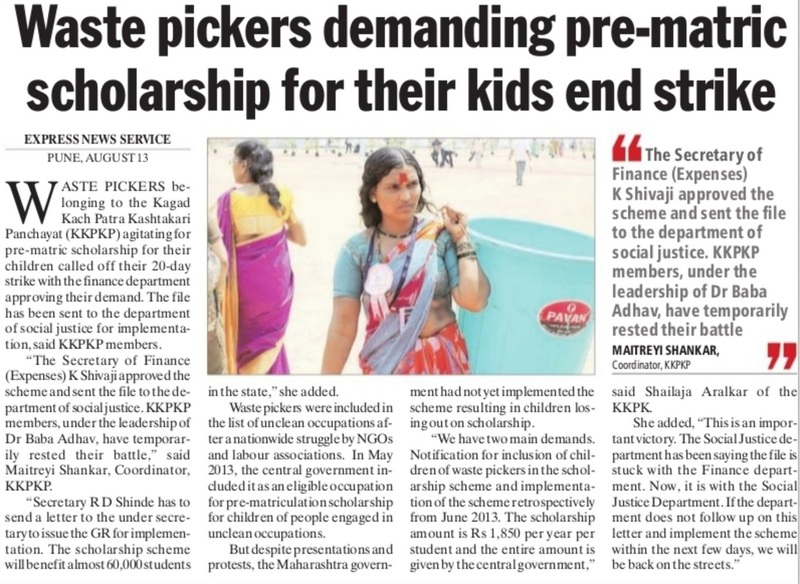 While the demand for free medical checks was earlier agreed to by the PCMC in a letter dated October 13 2013, they have now gone back on their decision and say that both medical checks and police verification be done by the waste pickers themselves, at their own cost. We have been in a conversation with elected representatives (MLAs) in Pimpri Chinchwad, about the provision of much-needed sorting sheds for waste pickers, using the discretionary funds at their disposal. Two MLAs have agreed to fund the sorting shed, one has even identified land on which the shed can be built. The sorting sheds will be built by the government according to designs submitted by SWaCH. In its MoU with SWaCH, Pune Municipal Corporation had provided for welfare benefits to be paid to waste pickers, but during the 5 years of the partnership, not a single such payment was made. SWaCH has been demanding disbursement of these funds for welfare which were allocated but not spent. The ongoing effort of the organisation now, is to widen the welfare net for all waste pickers, not just SWaCH members. A list of government welfare schemes (wrt social security, education and health) has been drawn up which waste pickers are (or ought to be) eligible for and efforts are on to ensure that they are allowed to avail of the same. In many cases, the waste pickers find themselves unjustly ineligible for the benefits. This is because many schemes specify that only those with BPL status can apply – few waste pickers will fall in the BPL category, despite being clearly disadvantaged, both economically and socially. In the education sphere, for example, KKPKP has pointed out that while the government scholarships reward those who score 80%-85% and above, it is very rare for a waste picker’s child to achieve such a high target – and yet, the community is definitely moving ahead in the increasing number of waste picker children who are in school and who need support. Since the cut-off for children with disability is 65%, it has been suggested that the same be used for waste pickers’ children also.